"The Honeybun range of products started from recipes passed down to her .... from her grandmother's travels in Northern Italy during the late 1940s." Honeybuns make a unique range of handmade cakes on a farm in Dorset. “I didn’t want to merely copy what other people are doing. My thing has always been let’s make something amazing”. So said Emma Goss Custard, the founder of Honeybuns, when I interviewed her recently. Honeybun’s products are predominately sweet treats such as cakes, brownies and cookies but now include two savoury tarts. They have won a number of Great Taste Awards over the years. Almost all are wheat free and gluten free, the only exception being their flapjacks. When I have had Honeybun’s products in the past I have always had the impression that here was a company whose priority was providing high quality food and the fact that it was also wheat and gluten free was almost incidental. It quickly became clear during my interview with Emma that my impression was right, the wheat free and gluten free aspects of Honeybun’s products are a happy accident. Emma has always loved making cakes. Her enthusiasm for making what she describes as “proper gorgeous food” was clear throughout our interview. The Honeybun range of products started from recipes passed down to her by her late mother. These came from her grandmother's travels in Northern Italy during the late 1940s. Wheat was rarely used, polenta and ground nuts such almond, pistachio and hazelnut were used instead. Interestingly over the years her mother had replaced these ingredients with wheat flour as things like polenta were difficult or expensive to get in the UK. When Emma got her hands on the recipes she experimented by going back to the original ingredients. I suspect since these recipes weren’t for your conventional victoria sponge this sparked Emma’s love of creating unusual treats. The Snowy Hills, which is one of Honeybun’s Great Taste Award winners, comes from these early days and comprises a ginger and polenta shortbread base with a moist lemon sponge top layer. This interest in the unusual was confirmed when she told me that one of her “rules” in deciding whether to develop a product is that it should “either be out there, but not being done well, or, it is not out there at all”. This focus meant that Emma was developing things that were wheat free and gluten free almost by accident. It took her brother, who is married to a doctor, to point out that Honeybun’s food was suitable for those suffering from coeliac disease. Emma knew nothing about this condition and so she did a lot of research including becoming “a bit of a geek” about how it affects the gut etc. She spoke to Coeliacs and discovered just how hard it was for them to find a treat that was good and made them feel vaguely normal and included. Since this early research Honeybuns have refined their recipes and production methods to assure the safety of their gluten free products for the Coeliac market. The idea of food that was inclusive goes back to the very early days of Honeybuns, before it was even called Honeybuns. Emma’s first business was making and delivering sandwiches and cakes around the offices and factories encircling Oxford in the late 1990's. Her aim was merely to make enough money to allow her to stay in Oxford, sharing a flat with her brother and enjoying life. Her passion for using the best ingredients and creating unusual products was evident even at this stage. Her sandwiches included camembert or brie on foccacia. She discovered that the workers "really loved being treated with proper gorgeous food” rather than the bland fillings on white bread which were usual at that time. Although she was getting great feedback on her sandwiches, the biggest praise was for her cakes. “You would often get ladies in particular who would forego the sandwiches and double up on the cakes.” So she dropped the sandwiches and started supplying patisseries and coffee shops. Honeybun’s latest product, the Sconeybun, seems to encapsulate much of the ethos of Honeybuns. It was developed because of feedback on Facebook from their gluten free customers who indicated that they were feeling excluded from the whole cream tea experience. 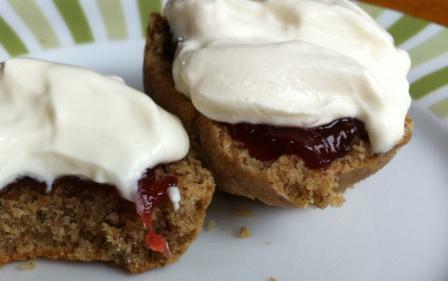 Initially Emma developed a more standard scone recipe, which is included in their recipe book. However she wanted to produce something for sale which was more innovative, “a bit of a hybrid which would lend itself to a cream tea experience but would also be a stand alone eat". She was also innovative in the ingredients she used. You can find out more about the Sconeybun including my assessment of it here. Honeybuns now supply delis and farm shops across the UK as well as being available in most Waitrose stores and John Lewis Cafes. I have found their online service to be very good and an error that occurred with one of my orders was quickly rectified in a very friendly and efficient manner.